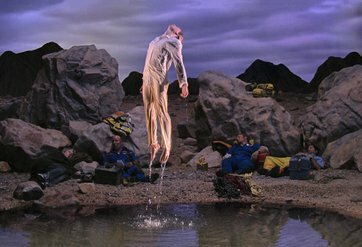 PARIS — The largest retrospective ever of the American video artist Bill Viola opened at the Grand Palais here last week. With 20 high-tech works that draw on age-old themes, the exhibition, which runs through July 21, showcases the artist’s work over the past 40 years in a series of large, darkened rooms that take on the hushed quality of a chapel. Although the show begins with “The Reflecting Pool” (1977-1979), the earliest piece in the exhibition, a video projection with a grainy, Kodachrome feel, and ends with “The Dreamers” (2013), Mr. Viola’s most recent creation, with seven high-resolution screens each showing a person under water, it is not organized chronologically. Instead, Mr. Viola, his wife and collaborator, Kira Perov, and the exhibition organizer Jérôme Neutres, arranged the exhibition around three metaphysical questions: Who am I? Where am I? Where am I going? Indeed, the show’s darkness draws visitors in, and the videos unfold at a meditative pace, compelling viewers to slow down. In “The Veiling,” which had its premiere at the Venice Biennale in 1995, images of a man and a woman walking slowly are projected on nine translucent panels. “We say we’re giving people the gift of time,” Ms. Perov said. Mr. Viola and Ms. Perov, who live in Long Beach, California and have two grown sons, have worked together since they met in the 1970s. He has the visions, she helps realize them, along with a small technical team. Mr. Neutres, who curated the exhibition for the Grand Palais, said he hoped that the show would bring Mr. Viola, long a fixture in the art world, to a broader public. He likened it to a retrospective of Picasso at the Grand Palais in 1966, which brought the Spanish artist fully into the wider public consciousness. “Bill Viola in 2014 is like Picasso in 1966,” Mr. Neutres said. Mr. Viola’s works draw as much from classical painting and modern dance as from film. Some works feature small LCD screens, some life-size monitors, others wall-size projections. Some, like “Four Hands” (2001), in which four different pairs of hands clasp each other for 23 minutes, have no narrative. None of the works uses dialogue. In other works, Mr. Viola casts characters to create miniature works of theater. “The Quintet of the Astonished” (2000) recalls a Caravaggio painting, in which five figures interact in slow motion. A centerpiece of the exhibition is “Going Forth By Day” (2002), the largest and most technically complex work in the show, which uses a cast of around 100 people and features five different scenes projected on the walls, which the artist has said is meant to recall Giotto’s frescoes in the Basilica of Saint Francis in Assisi, Italy. The exhibition also includes many of Mr. Viola’s best-known works, such as “Catherine’s Room” (2001), a series of five small television monitors showing a woman’s daily existence in a spare room; a book of hours come to life; and “The Sleep of Reason” (1988), a video homage to Goya’s “The Sleep of Reason Produces Monsters,” in which flashes of a man’s nightmares are projected onto the gallery walls. Although his work draws on Christian themes and motifs, including ascensions and annunciations, Mr. Viola said he preferred to think of his work as “spiritual” rather than religious. The Vatican had asked him to participate in its first-ever pavilion at last year’s Venice Biennale. “I politely declined,” he said. But his work has sometimes been shown in churches, and he is preparing an ambitious new video on martyrs that will premiere in St. Paul’s Cathedral in London in May. Back at the Grand Palais, the final rooms of the exhibition turn to darker musings on mortality. They begin with the arresting 2005 works “Tristan’s Ascension,” in which the literary hero is swept upward in a lingering shower of raindrops, and “Fire Woman,” in which a woman stands in black against a wall of fire. Mr. Viola said that his work had fundamentally changed after the deaths of his parents in the 1990s. The 2013 diptych, “Man Searching for Immortality/Woman Searching for Eternity,” show an older man and woman inspecting their respective bodies with a flashlight.